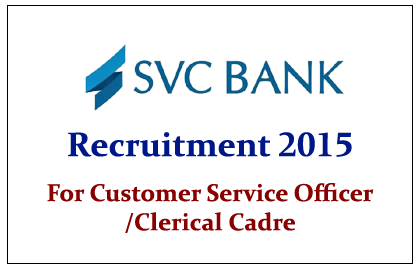 SVC Bank has announced openings for the post of Customer Service Officer in both Officer Grade and Clerical Cadre. Eligible Candidates can apply for this post. Eligible Candidates can Apply Online for this post from February 12, 2015 to February 28, 2015 through banks website:www.svcbank.comà Career Section. Candidates can pay their application fees through online from 12th Feb 2015 to 28th Feb 2015.